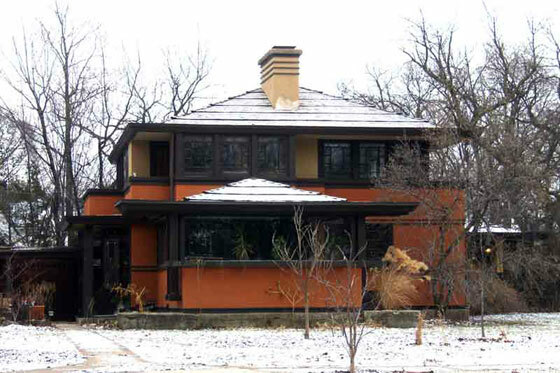 Built to house teachers for the Coonley Estate’s private school, Wright’s Playhouse, the Cottage is a classic example of Prairie School Architecture. Designed by Drummond in 1910 and completed in 1912, the two-story structure features a low pitched roof with flat edges, stucco walls, and wood bands that serve as a sill for an almost continuous band of windows on the second floor. Thinner, double wood bands continue the theme on the first floor between window groupings. Each bedroom’s balcony is seamlessly designed, making it almost undetectable from the street . The veranda was originally windowless and was enclosed in 1968. The house is a local landmark and is listed in the Illinois Historic Structure Survey. The current owners, who have extensively renovated and restored the structure, received an Olmsted Society award for the reconstruction of the roof.